They say bad things happen in threes, but good ones do too if yesterday was anything to go by. First I bought a new little car - a Hyundai i10, which is one of the new high economy, low emissions jobs. However, for a very modest price, this one comes with all kinds of toys not usually associated with basic models, and a five-year warranty to boot. My one is a black ex-demonstrator, six months old, with only 4000 on the clock. Then the minute I got home, Michael and Charlie arrived all breathless with good news, that they've arranged to get married on July 3, just before we all go away, so that it'll be like a honeymoon! It's to be a very small civil ceremony, close family only and their two best friends as witnesses. We're hoping Charlie's granny will make it. A blessing has yet to be arranged, but will happen some time later in the summer I think and will be an excuse for a bigger party. And finally, my dear friend Doo phoned up to tell me I'm a great-godmother to a little girl, Charlotte. The boys have chosen to get married on what will be Doo's sixtieth birthday, so it all ties up rather nicely, doesn't it? 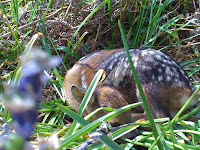 Look what Jonny found as we came down the hill through the bluebells and bracken this morning. He can only be days old. How fortunate that spaniels are gentle with other animals (except pheasants) and apart from giving a curious sniff, left him be so that I could photograph him.